We GUARANTEE that we will beat any local competitor’s price or it’s FREE! We will NOT be undersold! We are so confident in our pricing that we encourage you to bring us any local competitor’s advertisement or price quote and we will beat their price on the identical item or it’s FREE! Purchase at our showrooms with confidence and if you find a lower advertised price on the identical item on or before your delivery or pick-up date, or within 30 days of the original purchase date, we will beat the price or it’s FREE! All you have to do is bring us the local advertisement and we will issue you a refund or credit your account. Our Lowest Price Guarantee does not apply to special orders, close-outs, floor models, as-is, final sale, clearance, vendor rollbacks, or special purchases. It applies, one time, to the identical item (same manufacturer and model number) with the same terms, offers, conditions, delivery fees, and finance offer. Merchandise from buying clubs, auction sites and internet retailers are not applicable.When a competitor’s price is at the Manufacturer’s Minimum Retail Price, the price will be matched to comply with the manufacturer’s policies. The Lowest Price Guarantee is limited to competitors that have retail showroom locations within 50 miles of our showrooms. We understand buying furniture is a big decision, and that you want the purchase to match your style and not be a costly mistake. We want you to be completely satisfied with your purchase. We offer the following Happiness Guarantees to help you make your home great. All one-time reselections require the payment of a new delivery fee for your reselected merchandise. The original delivery fee is not refundable. For delivered merchandise, there is no handling fee for this one-time reselection. All pick ups will be charged a $99.95 handling fee for this one-time reselection. Regular furniture accessories on display in our showrooms or on our website may be returned for reselection or refund within seven (7) days of pick up or delivery with no restocking fee as long as they are returned in the original condition. Special order accessories, area rugs, lamps, wall art or other items that were ordered by customer request, are not eligible for reselection or return. Special orders are items manufactured based on specific customer request that are not regular showroom merchandise, and are not eligible for reselection or return. Close-outs, floor models, as-is, and clearance merchandise sold as final sale are not eligible for reselection or return. Mattress protectors, pillows, and sheets that have been opened are not eligible for reselection or return. A new delivery fee will be applied to all reselections and returns. If you choose to return merchandise that was delivered, it will be picked up on the next available Tuesday through Friday delivery date. Showrooms cannot accept returned furniture and mattress merchandise. Accessories may be returned to our showrooms or regional pick-up centers. All merchandise must be returned in new condition with no signs of wear or tear, scratches, nicks, stains, pet hair, pet or food odor, smoke, damage, or missing parts. The company reserves the right to inspect the items to determine final disposition upon return to our corporate distribution center or regional pick-up centers. Merchandise that is not in the condition as purchased will not be accepted for return or credit. Helping you achieve better sleep is our mission. During normal use of your mattress, the materials adjust to your body weight, shape and sleep habits. During this adjustment period, it is common for body impressions to develop and your body will need time to get used to a better mattress. Our Better Sleep Shop offers a 120 night sleep guarantee on every mattress sold, excluding floor samples. If you are not sleeping better after 30 nights of pick-up or delivery, and before end of the sleep guarantee, please contact our Customer Care Team to discuss your one-time reselection options. All mattress reselections are subject to the Sleep Guarantee policies detailed on our website including a $99.95 fee that covers handling, inspection and pick-up of your original mattress and delivery of your new mattress. Our Better Sleep Shop offers a 120 night Sleep Guarantee on our entire mattress collection. If you are not sleeping better after 30 nights and before 120 nights of delivery or pick-up, please contact our Customer Care Team to discuss your one-time reselection options. For Tempur-Pedic mattresses, please call 1- 888-317-7334 to speak to a Tempur-Pedic sleep expert for questions about your mattress or to discuss your sleep guarantee options. All mattress reselections are subject to the Sleep Guarantee policies listed below. Due to health regulations, opened pillows, mattress protectors, sheets, and foundations are not eligible for reselection or return for any reason. Power bases are also not eligible for reselection or return.Remember to follow the manufacturer’s care instructions to extend the life of your mattress. Your 120 Night Sleep Guarantee starts on your delivery date or pick up date. If after 30 days and before the end of the Sleep Guarantee period, you are not happy with your mattress, you may reselect for a different mattress. This one-time mattress guarantee applies to your originally purchased mattress only. Mattress foundations, frames, and adjustable bases are not returnable and are excluded from this reselection policy. Pillows, sheets and mattress protectors that have been removed from their original packaging are not returnable and are excluded from this return policy. Your new mattress must be covered by a mattress protector in order to qualify for a reselection. Protectors are available in our stores. You are responsible for any price difference between your original mattress purchase and the one you reselect. All mattress reselections are subject to a $99.95 fee that covers handling, inspection and pick-up of your original mattress and delivery of your new mattress. Only mattresses with the original tag of “Do not remove under penalty of law” are eligible under this program. Any reselection or return of showroom merchandise is subject to inspection by the Distribution Center Operations Department to ensure merchandise is returned in its original, new condition. Original condition includes, but is not limited to: no signs of wear or tear, scratches, nicks, stains, pet hair, pet or food odor, smoke damage or missing parts. No returns on opened pillows, sheets or mattress foundations. The Company reserves the right to determine disposition upon arrival at the corporate distribution center. Merchandise that does not meet the above condition will not be accepted. MATTRESS HAPPINESS SLEEP GUARANTEE: Helping you achieve better sleep is our mission. Often, a new mattress may feel slightly firmer than the showroom sample you rest tested because it hasn’t yet gone through a break-in period. A mattress break-in period refers to the amount of time it takes your body to bond with it. This may take 2 weeks to 4 weeks. That’s why, with our mattress guarantee, we ask you to sleep on your new mattress for at least 30 nights before reselecting another mattress of equal or greater value. If you don’t allow the mattress to break in, you might find yourself in a frustrating cycle, unable to find your ideal mattress! Our Better Sleep Shop offersa 120 night sleep guarantee, based on the mattress you select. If you are not sleeping better after 30 nights of pick-up or delivery, and before end of the sleep guarantee, please contact our Customer Care Team to discuss your one-time reselection options. All mattress reselections are subject to the Sleep Guarantee policies detailed on our website includinga $99.95 fee that covers handling, inspection and pick-up of your original mattress and delivery of your new mattress. Our White Glove In-Home Delivery Service is available on all merchandise within a fifty (50) mile radius of our showrooms. This service provides the highest level of assembly, inspection and after-purchase service. In-stock merchandise purchased one day qualifies for delivery the following day under our “Next Day Every Day Delivery Program.” In-stock merchandise paid in full or with finance approval, in our local delivery area, on regular delivery days can be delivered the next day. Arrangements must be made at the original time of purchase. Only pre-approved finance orders can be set for next day delivery. In home service on merchandise under warranty. Merchandise purchases must be paid in full or finance arrangements accepted at the time of the original sale. No delivery date or pick-up date will be set without full payment. You will be notified once your merchandise arrives from the manufacturer to select your delivery day. Only a delivery day may be selected and it is not possible to arrange for a specific delivery time. Your delivery or pick up must be completed within ten (10) days of arrival at our distribution center. Items stored in our warehouse over 30 days may incur a storage fee of 2% per month, or the merchandise may be released to another customer and no longer reserved for you. Items purchased from the Morris Back Room must be picked up within 7 days of purchase. A storage fee of 10% per week applies to all orders after 7 days of purchase unless arrangements are approved in advance. Once your delivery has been scheduled, you will receive a text, email, and/or a phone call two (2) days prior to your delivery confirming your delivery date. Customers must confirm that someone 18 years or older will be available to accept delivery during the time frame referenced via text, email or phone call. Without confirmation by 8am the day prior to your delivery, we are unable to place your order on our delivery truck and your order will need to be rescheduled for a future date. One (1) day prior to your delivery, you will receive a time frame (via text, email, or phone call) with the estimated two (2) hour start time for your delivery. Our delivery team will give you a 30 minute call-ahead to let you know the expected time of arrival. Our website provides information on your delivery starting at 1:00pm on the day before your delivery. If no one is home to receive your scheduled delivery, the original delivery fee will be forfeited and a new delivery fee will be charged. Please provide a 48-hour notice of any changes to your scheduled delivery date. Customers are responsible for all measurements of doors, elevators and stairways. Should your piece not fit, delivery fees are non-refundable. Our delivery team is NOT PERMITTED to move or handle your existing furniture as specified by our insurance carrier. Please have your room and space ready, making sure all pathways are clear and removing all breakable items in the delivery path. Please secure family pets since doors will be open during the delivery process. Our delivery team will place entry mats and blankets on the floor in your entry area during inclement weather to protect your floors. To ensure the safety of our drivers, snow or other pedestrian obstacles must be removed by you before our drivers can accomplish delivery. If a mattress was purchased, we will remove your old mattress on a one-for-one basis. Limit one mattress and foundation for each mattress set purchased. We reserve the right to refuse removal of soiled or stained mattresses or that show evidence of possible insect infestation. Delivery teams will not move, set up, or disconnect electronic devices including and not limited to televisions, audio equipment, speakers, computers, electronic games and cable boxes. Difficult or unsafe deliveries (such as window entry) will not be done by our delivery drivers. Hoists and balcony deliveries will not be attempted under any circumstances. Deliveries above the third floor (without access to an elevator) are subject to a delivery surcharge fee that must be paid at the time of purchase. Deliveries require a responsible adult, age 18 or older, to be present to accept and inspect the merchandise at the time of delivery. Delivery damage to you home and property must be reported at the time of delivery to the Customer Care Department. Damage to your merchandise must be reported with 3 days of delivery. We are proud to offer quality products with great value to our customers. All furniture is thoroughly inspected in our preparation and delivery process to ensure quality. In the rare occurrence that an item arrives damaged on delivery or has a manufacturer defect, please notify the delivery team before they leave your home or call Customer Care at the number listed below. Once an item is accepted, all furniture items will be repaired to new condition by our trained expert repair technicians. Reselections, returns, and exchanges of damaged merchandise will not be made after items are accepted. Regular stock items shipped directly to your home from our vendors are eligible for reselection or return by contacting our Customer Care Team by phone or email at customercare@morrisfci.com within three (3) days of receipt in your home. All direct ship items must be shipped back within 7 days of receipt as directed by our customer care team. All reselections and returns of direct ship items are subject to all policies above. Custom special order items are not eligible for cancelation, reselection, exchange or return. Furniture and mattresses may be picked up at the corporate distribution center or at the regional pick- up centers. Only showroom floor samples may be picked up directly at a showroom. Customer pick-up items come packaged and boxed and are often times not assembled. Customer pick-up items do not receive in-home warranty coverage and those items will need to be returned to the corporate distribution center or regional pick-up center for warranty coverage. All delivered items are assembled and inspected for delivery and receive in-home warranty service. When Protection Plan Coverage is purchased for pick-up items, those items will receive in home service. We require proper identification (e.g. driver’s license with photo) at time of pick up. The identification must match the name on the sales order. If someone else is picking up the merchandise for you, notify us of the name of the person in advance. We will require proper identification of that person. Any special requests must be arranged at the time you are setting up your pick up. Merchandise must be picked up within seven (7) days of the original order or within seven (7) days after the product has arrived at the corporate distribution center or regional pick-up center. Customers are responsible for inspecting all merchandise prior to loading and will be asked to acknowledge receipt of merchandise in satisfactory condition upon inspection at our pick-up center. Since many items available for pick up are factory packed and sealed, there may be imperfections that will lead to disappointment if not inspected prior to leaving our pick-up center. Due to insurance liability, we are not able to assist in the loading, assembly or disassembly of your merchandise. Assembly by our trained staff is available with our White Glove Delivery Service. You are responsible to bring your own padding, rope and assistance if you require help loading merchandise into your vehicle. Morris Furniture Company is not responsible for any damage to merchandise during the customer loading or transportation process. Buyer accepts full responsibility for securing merchandise in or to their vehicles. We do not recommend transporting furniture or mattresses in the back of any open trailer or flatbed truck, on top of any vehicle or vehicle rack. Buyer is responsible for all assembly after pick up. For warranty repair service on items picked up from our pick-up center, customers are responsible to return the item to our corporate distribution center or a regional pick-up center for repair. Items cannot be returned to a showroom for service. Our White Glove Delivery Service includes merchandise assembly and in-home service for one year. In the rare occurrence that an item is determined to have a manufacturer defect after pick up and the product is in your possession, please notify the Customer Care Department at the numbers listed below. Reselections, returns, and exchanges will not be made after items are accepted. Once an item is accepted, all furniture items will be repaired to new condition by our trained expert repair technicians. Items that were picked up that need service must be returned to the corporate distribution center or a regional pick-up centers for inspection and service. Items cannot be returned to showrooms for service. The Furniture Protection Programs cover common household mishaps for fabric, leather, wood and/or hard surfaces, outdoor furniture as well as failure or breakage to adjustable bases. Service requests for covered accidental damages can be filed with customer service at 1-800-527-8485. A beneficial no risk policy also applies to the Furniture Protection Program. If there is never a need to file a service claim during the term of the policy, the Protection Plan will be refunded as an in-store credit good towards a future purchase that is at least twice the amount of the credit. Credits are for furniture and mattress purchases only, not for rugs or accessories. Claims must be submitted within 5 days of the date of occurrence to 800-444-0648. 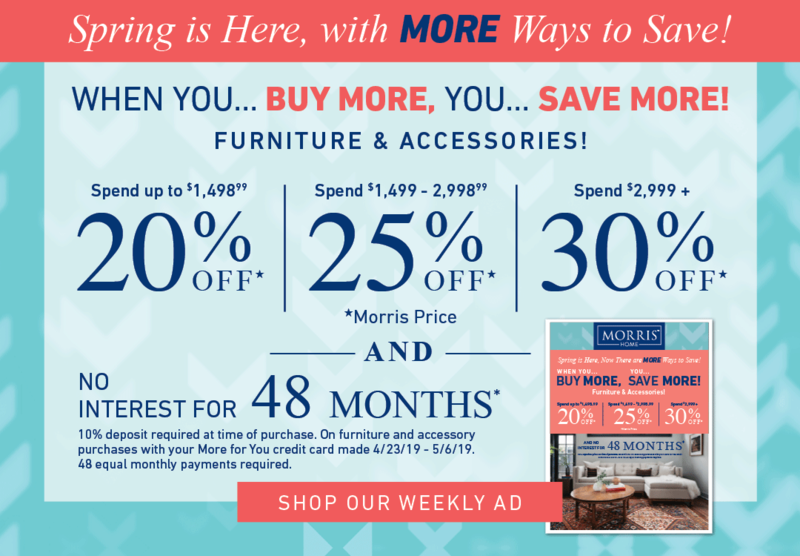 Morris Furniture Company, the operator of Morris Home showrooms, Ashley HomeStore showrooms, The Better Sleep Shops and the Morris Back Room, provides a one-year limited warranty and honors all manufacturer limited warranties with coverage of parts and labor for one year from the delivery or pick-up date. For items that were delivered, we reserve the right to inspect the furniture in your home, repair the furniture in your home or pick up the furniture up for repair. Warranty service for items that were picked up by customers requires the items to be returned to the corporate distribution center or regional pick-up centers. Showrooms cannot accept merchandise for service. Morris Furniture Company grants or implies no warranties of performance on any of its products. Please note, under no circumstances are we liable for any special, incidental, indirect or consequential damages, even if we are informed of their possibility. This limited warranty covers all furniture purchases, excluding Back Room clearance merchandise or discontinued items marked “As Is.” Some products include additional parts limited warranties. All products carry a maximum one-year labor limited warranty. Warranties for commercial use are not offered by our manufacturers. We are committed to ensuring your satisfaction through our Service Department. We will provide repair service for manufacturer defects under the terms stated in our limited warranty and the manufacturer's warranty. Upon being notified of a warranty claim, we will: 1) Inspect the damaged merchandise to determine if the damage qualifies for the warranty repair, 2) If the repair is covered by the warranty, we will provide service in your home, our corporate distribution center or by the manufacturer depending on the repair needs, 3) If a repair is not possible, a furniture replacement may require authorization by the manufacturer. Should a replacement be authorized and the original product is no longer available, you will be able to reselect any item up to the original purchase amount or manufacturer prorated amount. If damage to the merchandise is due to misuse or abuse and not covered by the warranty, you will be responsible for parts and labor costs for the repair. After the one-year warranty expires, we will assist you in obtaining parts from the manufacturer at your cost, if available. You will be responsible for any shipping and labor costs that may apply. During service, your More for You billing plan remains in effect if you financed your purchase. Your original promotion period deadline does not change. Monthly payments must be made during service/exchanges on deferred billing plans to avoid late charges or interest. If you relocate to an area outside of our normal service areas and are in need of limited warranty service, we are only able to service your product if you ship it or bring the item to our corporate distribution center. As an alternative, you may contact the manufacturer of the product directly, or work through a local dealer to get warranty work completed. If you return the product to us for repair, you will be responsible for all shipping, handling, and freight charges to and from our corporate distribution center. Upholstery/Area Rugs: Dye lots and swatches seen at the store may differ slightly from actual dye lots on delivered manufacturers’ product. We are not responsible for any of these dye lot variances. Upholstered fabrics are warranted against defective material or workmanship for one year from the date of purchase under normal care and use. This warranty does not cover fading, pilling or shrinkage and is not valid where there is evidence of heavy soiling or abuse. Fabric damage or fabric failure due to improper cleaning or animal use is also excluded from the warranty. Consult your salesperson for proper cleaning instructions. The fabric warranty will not be honored if any evidence of animal damage is found. Leather is a natural material and surface marks, brand marks, natural scarring, insect bites and variances in color show that the leather is genuine top grain. Since these unique characteristics are not defects and provide uniqueness to the product, these items are not eligible for return. Wood, marble, granite, slate, stone and weathered wood are natural products and prone to variations in color, pattern and density. Since these unique characteristics are not defects and provide uniqueness to the product, these items are not eligible for return. In our showrooms we offer Custom Special Orders allowing you to select the furniture of your dreams. Since your special order is unique to you, we are unable to allow returns of special order merchandise. Special order items are items not displayed in our showrooms and not stocked in our warehouse. They may be items displayed in our showrooms, but available in a different color, size or finish as you desire. Because your order is unique to you, we require all special orders to be paid in full at time of purchase. If you choose to pay with your More for You credit card, a deposit of 25% is required and can be made with our 6 months deferred interest program. Once production of your special order has begun, canceled special orders are subject to a non-refundable service charge equal to 25% of the special order amount. To return a special order, we must be notified within three (3) days of your delivery or pick up. The completed return of merchandise must take place within seven (7) days of your original delivery or original pick up date. Custom Special Orders are not covered under our Happiness Guarantee. Estimated delivery time will vary for Custom Special Order merchandise based on the custom options you choose. It could range from six (6) weeks to twenty (20) weeks depending on the manufacturer and shipping time. It is important that you carefully measure your space before placing your order. If your merchandise does not fit in your room (down the hallway, up the stairs, through entrances, etc.) all returned special orders are subject to a service charge equal to 25% of the special order amount. To return a special order, we must be notified within three (3) days of your delivery or pick up. The completed return of merchandise must take place within seven (7) days of your original delivery or original pick up date. If on occasion, a piece arrives damaged, our trained, master craftsmen will restore the piece(s) to its original condition. Our buyers audit all special order sales agreements for pricing accuracy and completeness. If adjustments are needed you will be contacted for approval before your order is placed with the manufacturer. All sales are final on the above items. Clearance and floor sample items are sold at reduced prices and may include scratches, damages and other imperfections. Please thoroughly inspect your clearance purchases and note any imperfections on the “Open Box” form you will be asked to sign for each clearance item you purchase. There are no refunds, exchanges, reselections or service provided on as-is, close out, floor model, final sale, and clearance merchandise. Pick up or delivery of clearance items must be completed within 7 days of your purchase. Clearance items are excluded from our Happiness Guarantee, Price Guarantee and Mattress Sleep Guarantee. All orders are to be paid in full at the time of the original order. Delivery cannot be scheduled until complete payment or finance approval is received. Special order merchandise will not be placed with the manufacturer until the original sales order is paid in full. All refunds will be given in the form of the original payment. If payment was made by cash or check, a refund check will be mailed from our corporate office within 7-10 days after the product is returned in the original condition and inspected. Refunds on bank cards or More for You cards are credited to the card used as payment and will show up as a credit per their policy. When a purchase is made using multiple methods of payment, credit to finance companies is applied first as required by our agreement with them. If you received a free promotional item or gift card with your purchase, the promotional item must also be returned in its original condition with associated returned merchandise or you will be charged full value of the promotional item. Your receipt may attribute a nominal cost on the item for the group/set price which will be adjusted to the full value. There is a $40 charge for any returned checks. Any open balance must be paid with an alternate method of payment such as cash, credit card, money order or cashier’s check. All open balances require payment in full before delivery will be scheduled. Located off I-675, at exit 20, Dayton-Yellow Springs Rd. In an effort to provide you with the highest quality service, please reach out to our Customer Care Team to assist you after your purchase is in your home. The merchandise is being offered in the present and existing condition. Any defects discovered after purchase are the customer’s responsibility and these items are not eligible for return or exchange. Items displayed on morrisathome.com that are not displayed as part of our showroom selection are listed as “Available to Order” or special order.These are custom special order items specially ordered by our customers. These items include our limited warranty but are not eligible for cancellation and are not covered under our Happiness Guarantee. The selling of merchandise, at reduced prices, often to make way for new stock. These items are not covered by the lowest price guarantee or the happiness guarantee. Merchandise that the company will no longer be stocking. These items are often sold at a reduced price and are not covered by the lowest price guarantee or the happiness guarantee. Department dedicated to assisting customers during or after delivery or pick-up. A fee paid by the customer for the delivery of the purchased merchandise. The fee is determined by the number of items and the delivery area. Exchange of the identical item as approved by the Customer Care department when our service technicians cannot service the item. Rules and conditions apply. Merchandise that is not eligible for return, reselection or exchange. Merchandise that has been used as the display item within the showroom. These items are often sold at a reduced price and are not covered by the lowest price guarantee or the happiness guarantee. They are sold As Is. A fee that is charged to the customer for a one-time reselection under the Happiness Guarantee for processing the merchandise. Program that allows a one-time reselection or return. Rules and conditions apply. The condition of merchandise returned for reselection, return or exchange. It is in new condition with no signs of wear or misuse. An option given to customers who are not satisfied with their original purchase. It allows a customer a single chance to reselect their merchandise with no restocking fee. Rules and conditions apply. Used to describe when a customer opts out of the white glove home delivery for their own transport and assembly of purchased merchandise. Free items or services provided with a completed sale. Customers are responsible for the value of the items if the full sale is not completed. Rules and conditions apply. Extends warranty coverage for merchandise purchased. The cost of the plan is not lost if not used in the warranty period. Rules and conditions apply. One time option to return the merchandise and get your money back under Happiness Guarantee. Rules and conditions apply. One time option to change to a different item under Happiness Guarantee. Rules and conditions apply. A fee that is charged to the customer when an item is returned for refund or credit. This covers the processing and restocking of the merchandise. Return of item under the Happiness Guarantee. Rules and conditions apply. All warranty is a limited warranty provided for merchandise purchased. Rules and conditions apply. The description of our quality in-home delivery service.